Some of the worst shipwrecks from the past 5 years. 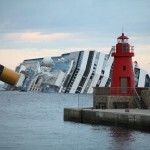 January 14 2012 - The 291 meter long, 10000 dwt passenger ship Costa Concordia went aground off the island of Giglio, Italy. The cruise ship, loaded with more than 4,234 passengers and crew, struck a rock on the seafloor tearing a 160 foot gash along the port hull. Vessel capsized over on it's side resulting in 32 deaths. October 4 2011 - The 236 meter long, 47230 dwt container ship Rena went aground on the Astrolabe Reef north of Motiti Island near the Tauranga Harbor, New Zealand. 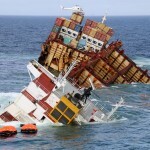 The Rena broke up on the reef spilling containers and fuel oil onto the nearby beaches before the vessel. Svitzer Salvage engaged and removing the bow section off the reef for the following 3 years. August 7 2010 - The 234 meter long, 38485 dwt container ship MSC Chitra collided with the bulk carrier Khalijia III just outside Mumbai harbor, India. The MSC Chitra's port hull was ripped open and the vessel listed over spilling containers and fuel oil into the sea. The vessel sustained too much damage and was later towed into international waters and sunk. Keep up with the latest Maritime accidents and casualties news in our weekly email. Marine Review was founded in 1891 at Cleveland, Ohio. The magazine included brief summaries and end of the year reviews on shipwrecks and minor maritime accidents. The Lytle list compiled from the official merchant marine documents of the United States and other sources. The database covers merchant steam vessels of the United States between 1807-1868. Maritime accidents recorded in the Annual Reports for the USLSS. These reports were published each year from 1876 to 1914. 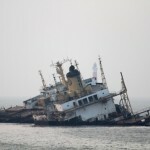 Shipwrecklog.com is a maritime casualty news website and database.